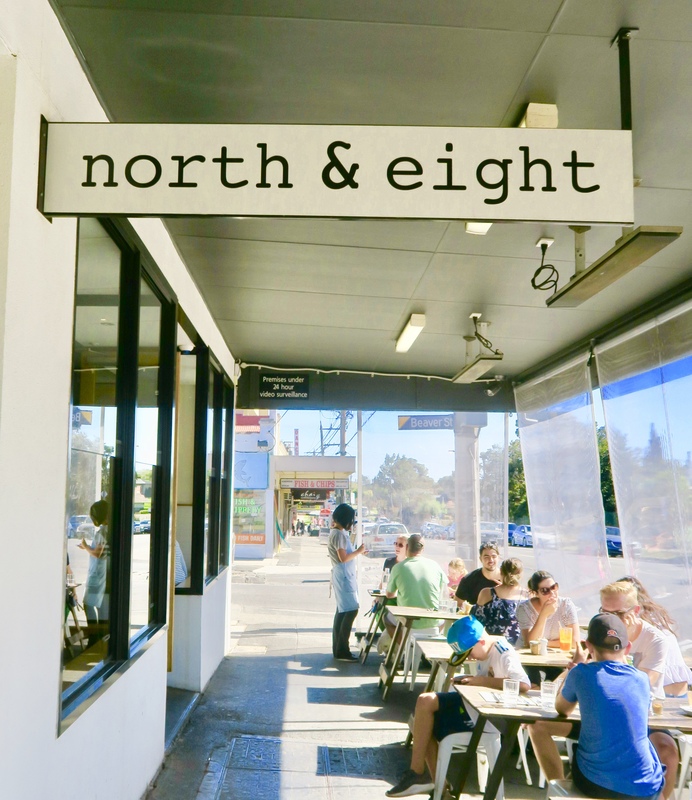 North & Eight Cafe is at the residential end of Buckley Street in Essendon. But at first glance, I could have sworn we were hitting up a cafe in trendy Prahran or Brunswick Street. Their food-laden dishes carried around by their good looking team appear like works of art. They serve Proud Mary ethically sourced coffee and the customers look right at home whether in their workout gear or a bit more glam. There are dogs outside and families inside. It is obviously the place to be seen. It is a lovely sunny day and there is no room at the tables outside, so we sidle into the cool recesses of the industrial chic interior. 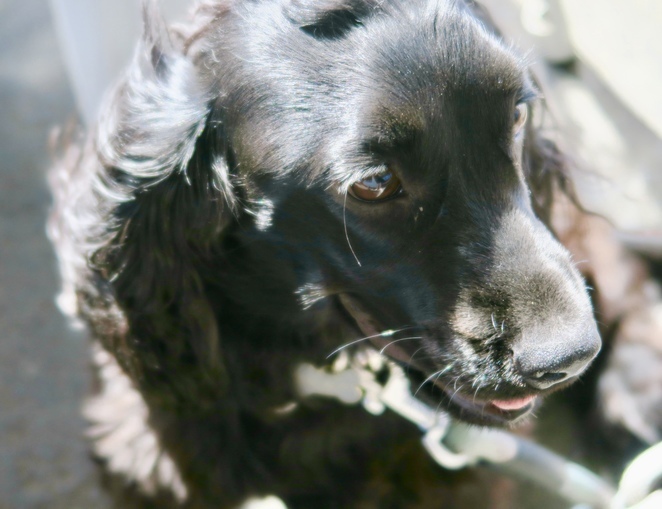 We head for the back as we have brought somebody with us whose behaviour can be somewhat erratic. Ten-month-old, Litte Arthur is either a barrel of laughs or a puddle of tears. But North & Eight puts him in barrel mode. And we shouldn't have had any concerns in any case about where we seated him as cafe owner Walid Hijazi immediately put us at ease. "We love kids here," he said. 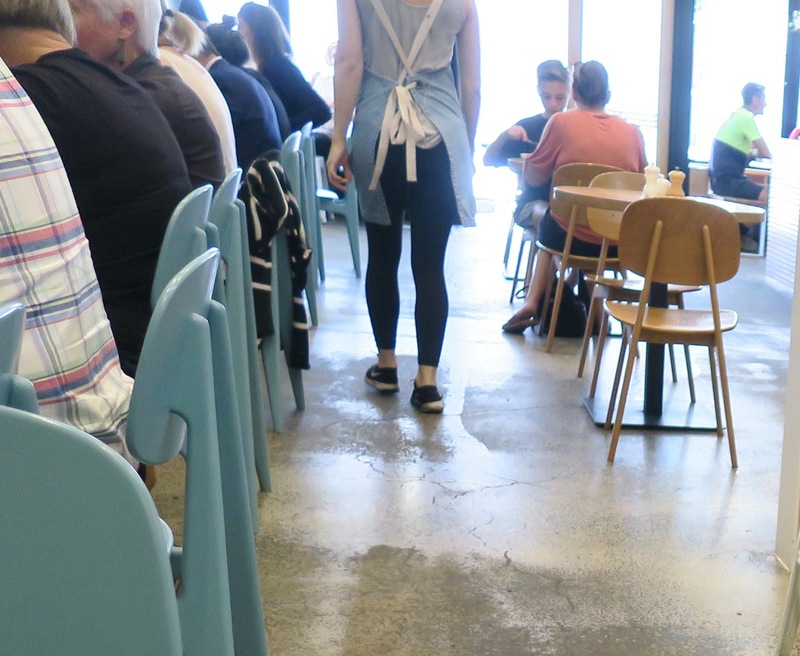 "We even designed this cafe so that every table has a parking bay for a pram." Looking around, I notice that while there aren't lots of prams there is certainly room for them and this feature makes the surroundings more spacious for everyone. And the child friendliness continues. There is a changing table in the commodious washroom and even though the cafe is busy, Walid takes the time to bring Arthur a colouring-in sheet and some brightly coloured pencils. What are these? They look like fun. Perhaps they'll bounce. I'll chuck them on the floor. Having never seen such delightful objects before at least within his grasp, Arthur's reaction is to throw these on the floor one by one to see if they bounce. In between picking them up for him, this gives us time to read up on the new menu. "We change it about every six months", Walid said when he returned for our order. 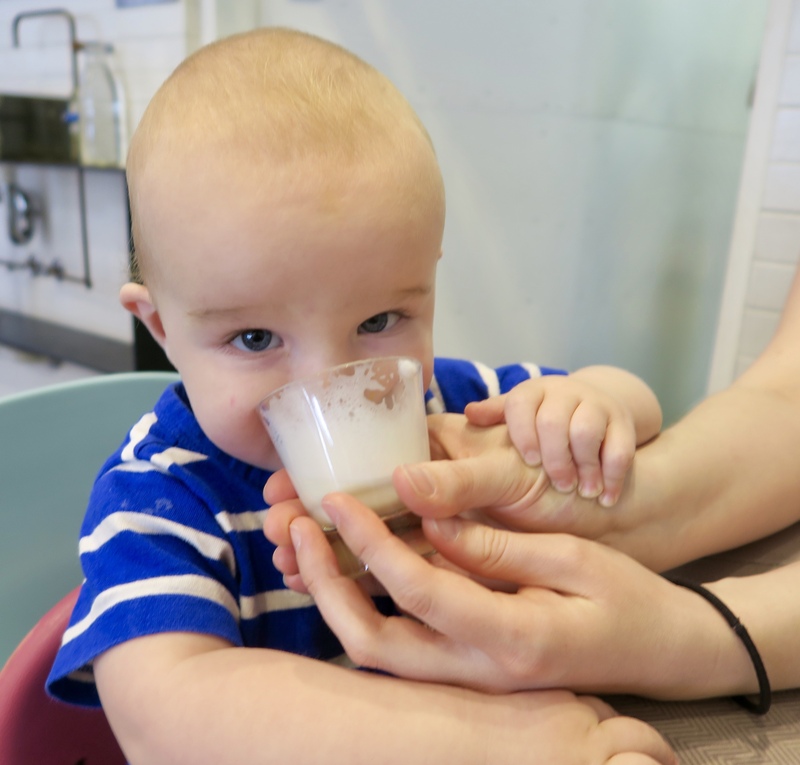 "We get a lot of local repeat customers so it's good to shake things up a bit. 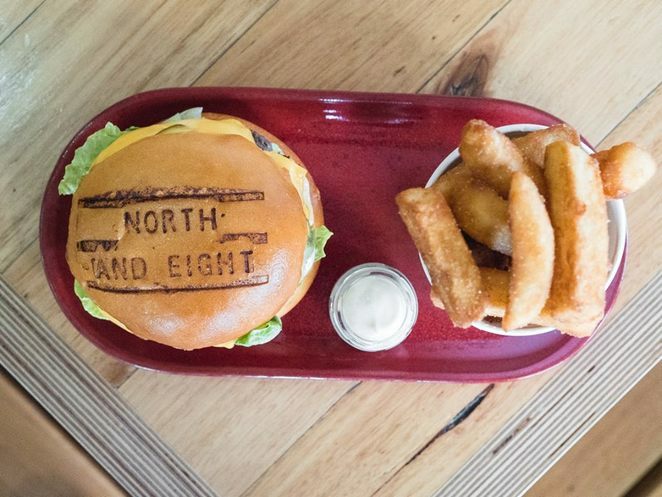 But we still keep old favourites such as the wild rice bowl, the vegetarian fritters and the wagyu cheeseburger in a brioche bun." When rejigging a menu, Walid says the team look to Asia for inspiration as, "that is where everything innovative is happening on the food scene." And Walid should know, as he has also owned and operated what became an inner-city institution Babble Bar & Cafe in Prahran and also Gypsy Bar. The wagyu cheeseburger comes in a fresh brioche bun with a side of hot chips. Filled with pickles, lettuce and our tasty special sauce. Image Facebook North & Eight. After he moved to the suburbs with his young family (his three kids attend local schools). He thought he had left 'the scene' behind him but then decided he could bring the concept of an innovative inner-city style cafe to his own local area. 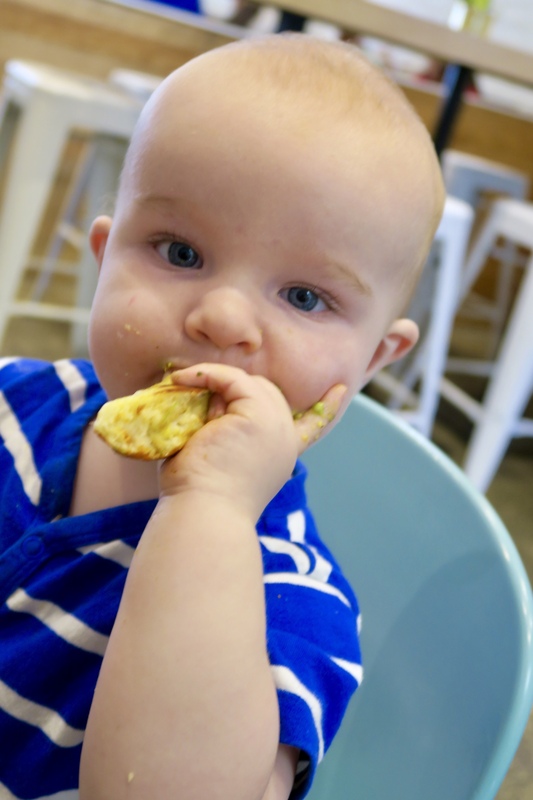 As my daughter and I are sitting near the entrance to the kitchen, we can see just how cutting-edge and imaginative some of the creations are as they make their way past us, carried out to eager diners. "This is the Korean chicken" said Walid. I fleetingly catch sight of a laden plate of crunchy golden chicken piled high on a waffle, with kimchi (fermented vegetables) gochujang (red chilli paste) mayo, slaw. Arranged on the side is a container of chips placed on its side giving the sense of overflowing abundance. "Bring it back here," I feel like yelling. But we had already ordered and in a bid to eat healthily. I'd opted for the popular wild rice dish. 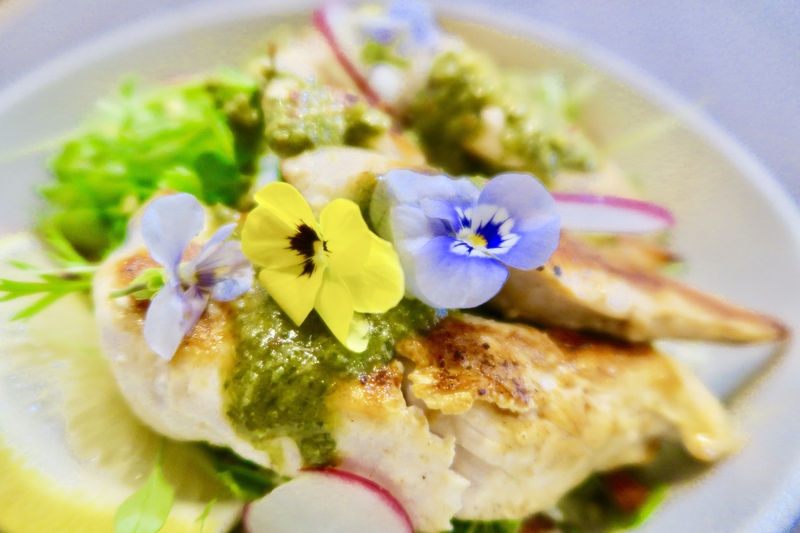 It arrives like a spring welcome as it is decorated with edible flowers. These are artfully scattered over a bed of superfoods including kale, quinoa and activated almonds. The feta, avocado, rich tahini yoghurt sauce and cranberries added yummy tastes and texture. I've also chosen to add additional protein so my dish comes with chimichurri chicken. It is delicious but I struggle to finish it all and I do see a customer ask for a container, so she can take part of her lunch home with her. There are no such things as meagre rations here. My daughter had ordered one of the new additions to the menu - a Japanese inspired okonomiyaki pancake. 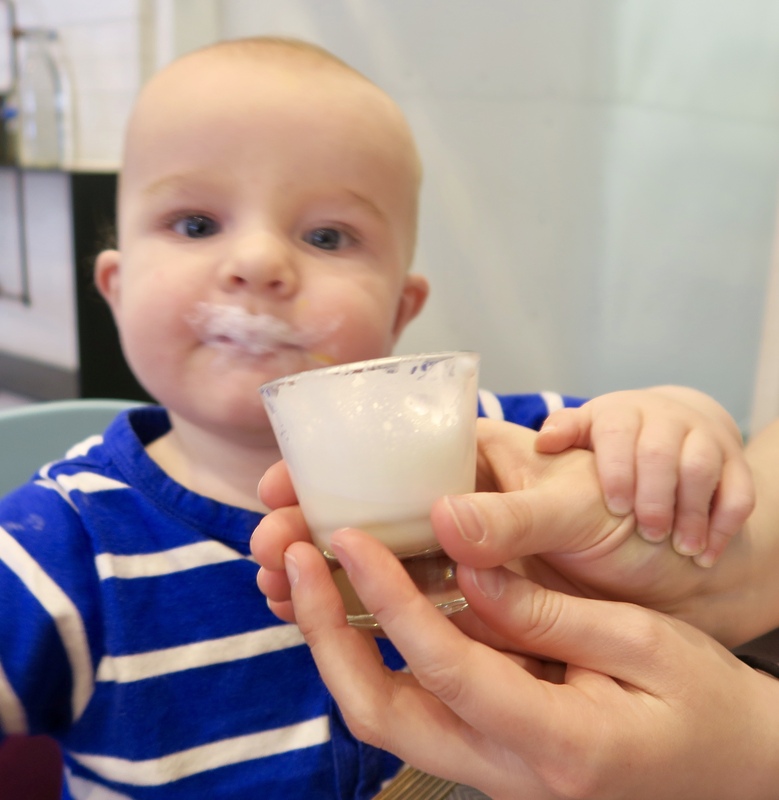 When offered a taste I find it lighter and fluffier than versions I have tried before. 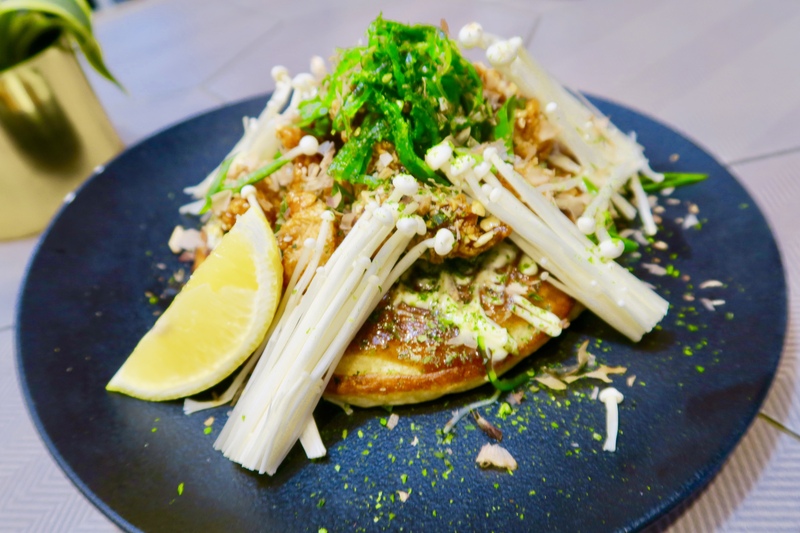 The mixture contains cabbage and carrot and is topped with kewpie mayo, okonomi sauce, wakame (edible seaweed), green onions, and a sprinkle of bonito flakes (dried, fermented, shaved fish). 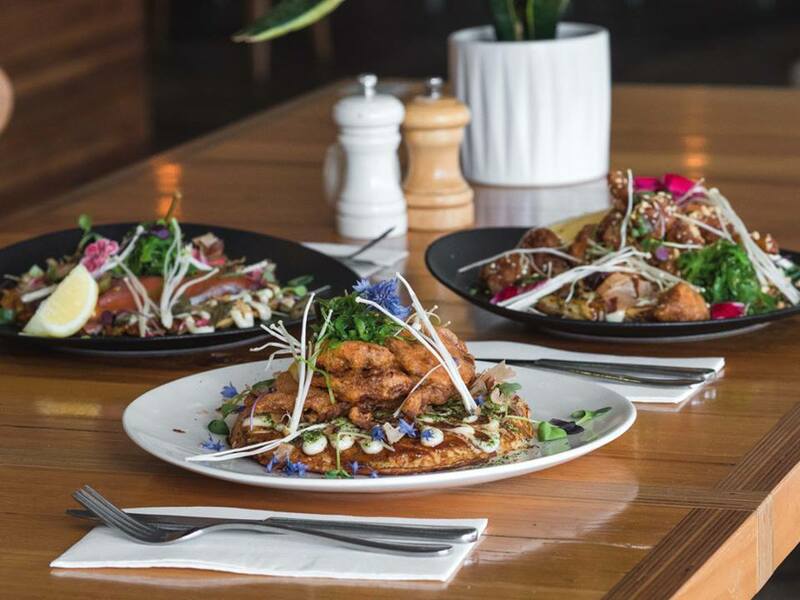 You could also choose additions such as soft shell crab with sriracha, cured salmon, Katso pork belly or chicken with peanuts. Pillars of enoki mushrooms are propped up on the sides as tall and straight as goal posts. A definite winner. The texture is light and soft, but chewy. So guess who eats most of it? Arthur loves it. Perhaps next time we'll think to get him something off the Little Tacker's menu but we did provide him with his own babycino after he started eyeing off our coffees. We were also privy to seeing other sweet temptresses from the new menu such as the Ferrero Rocher French toast - slices of brioche loaf topped with Nutella, hazelnut mousse, praline, chocolate ganache and Bacio ice cream. It comes with a crown of flowers and a magical sprinkle of edible gold dust. 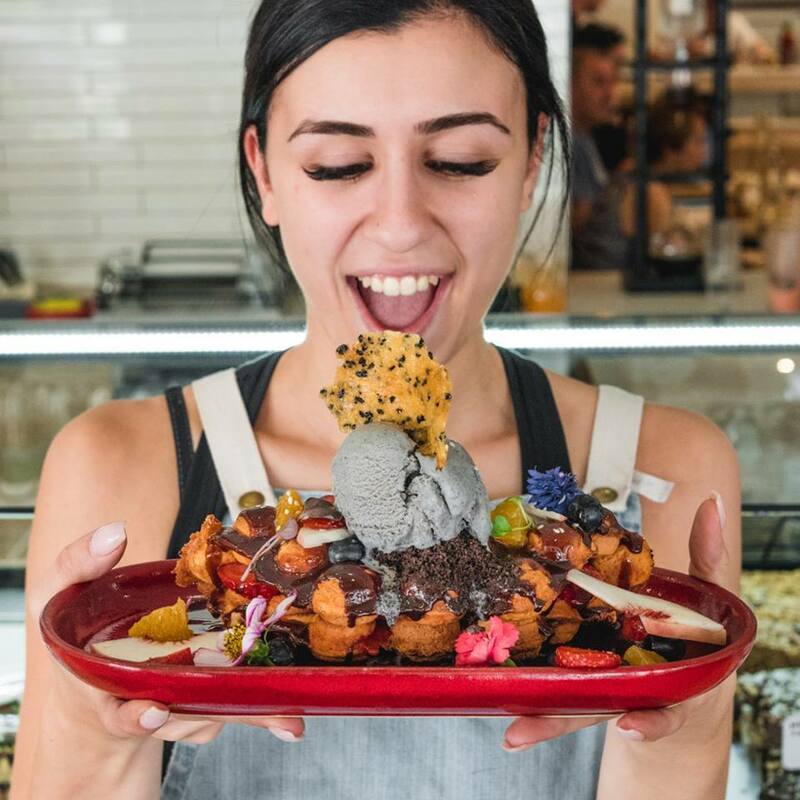 The photograph below shows the Hong Kong egg waffle with chocolate fudge, chocolate soil and black sesame ice cream topped with poached strawberries, seasonal fruit, sesame crisps and lychee pearls. Now imagine that dish parading past you and not wanting to follow it. 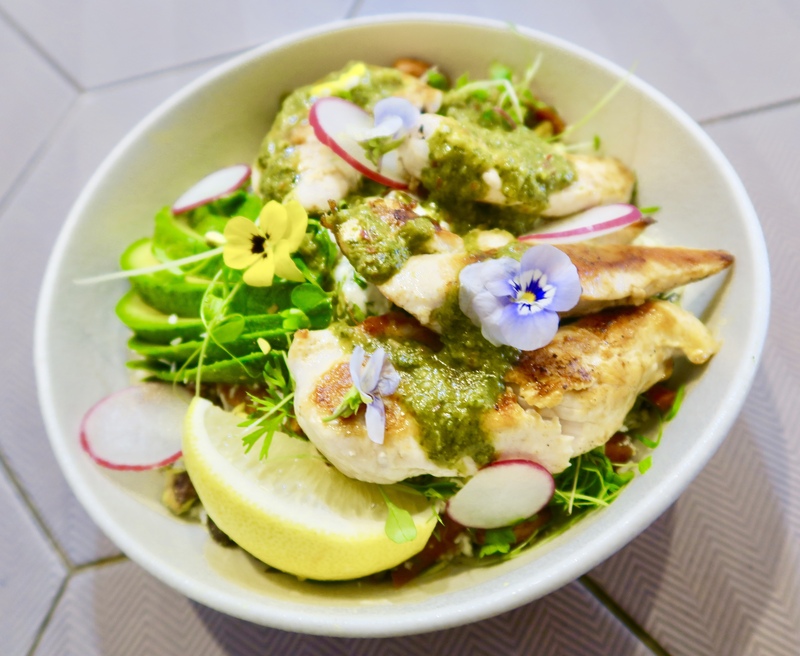 According to Walid: "The wild rice can easily be made as a vegan option, coconut yoghurt can be used instead of regular yoghurt on the bircher muesli, and the acacia bowl can be made with almond milk." Gluten Free items are also clearly marked. My wild rice salad, for example, was GF. Another option is the coconut black chai pudding served in a young coconut shell and topped with fruit, berries and nuts. 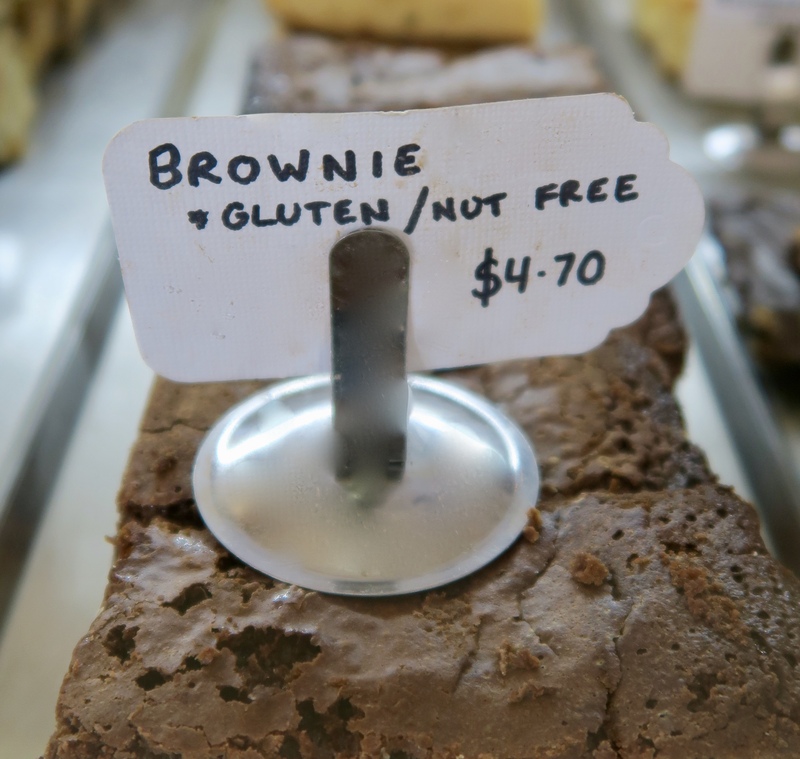 GF bread is on offer and the long front cabinet near the register is loaded with house-made cakes and a number of items are marked as GF such as the brownies, blondies and protein balls. The chefs obviously have loads of fun in coming up with their creations and their house-made doughnuts are a sight to behold. They change daily as do flights of imagination but the ones on display during our visit are loaded with M&Ms, lolly straps and Nutella. Many of the staff are local and seem to know a number of the customers. They obviously work well together as a team. I noticed that they kept a respectful distance away but also watched your table, so customers were never waiting for service. They were also wonderful with little Arthur. Yet while this is a local haunt it is well worth travelling across town for if you are a non-local. Make a day of it and visit the little known architectural gem the Walter Burley Griffin designed Incinerator (now a gallery), take a walk up Buckley Street for some shopping or visit one of the many great parks in the area. 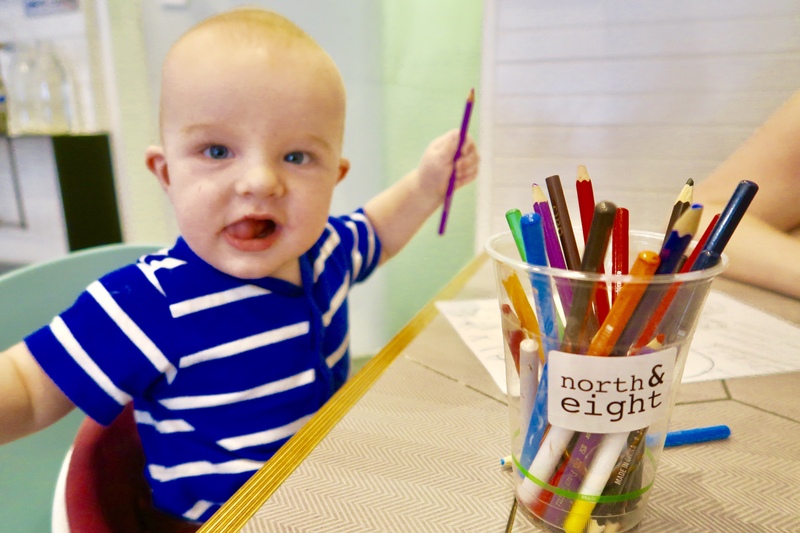 For whether you are vegan, vegetarian, a coffee snob, a sweet tooth or need a family-friendly brunch spot, you will find much to delight at North & Eight. Oh, and people park their pooches outside as well.